On behalf of everyone at the Home we like to wish you, your families and your furry, fluffy and feathery friends a Merry Christmas. 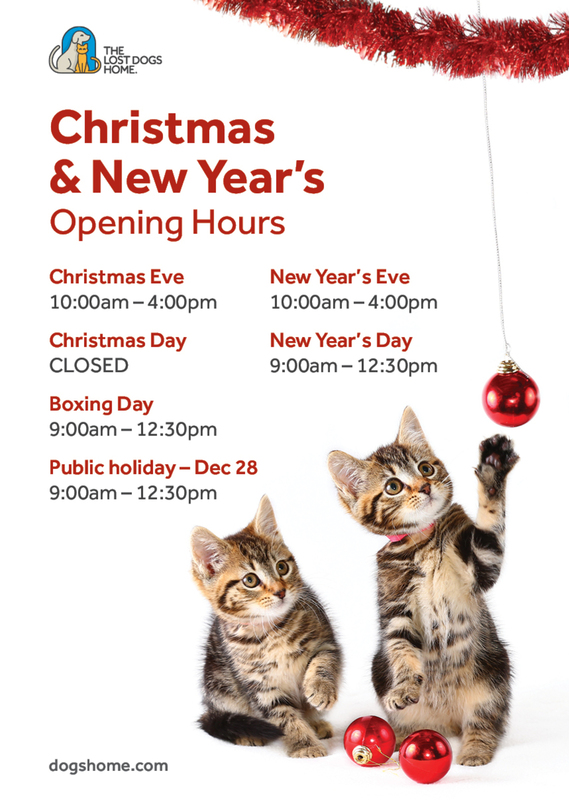 The Lost Dogs’ Home’s North Melbourne shelter and Frank Samways Veterinary Clinic will close today from 4.00pm and reopen Saturday December 26 at 9.00am. Christmas day is a busy day for the whole family. So, in preparation for the big day we want to give you some tips on how to make the festive period an enjoyable one for the whole family. It is still important for your pet to have their daily exercise – even on Christmas Day – so don’t forget to walk your dog. Tomorrow will be a warmer day, so be mindful of the time of day you take your dog for a walk. Look to walk your dog when it’s cooler like first thing in the morning or late in the afternoon. If you are going out or expecting visitors, exercise your dog before they arrive so your pet is restful once the festivities start. While it may be tempting to toss a bone, or share your Christmas meal with your beloved pet, leftovers can cause stomach aches for your pet – and can lead to serious problems down the track. Avoid feeding your pet foods like chocolate, lollies, Christmas pudding, cooked bones and corn cobs. If you’re dining at a friend’s place and they ask you to not feed their pets – honour this request, they’re asking you for a reason. Change the way you feed your pet – maybe create a treasure hunt through the garden with your pet’s special treats. Look to buy or make special treats for your pet. There are a range of recipes available online. Most importantly, look to spend some quality time with your pet on Christmas day – play some games outside with them, or take them on an extra special walk.